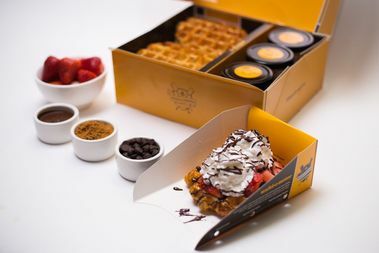 Wafels & Dinges is among the eateries participating in this year's Taste of Times Square for the first time. TIMES SQUARE — A long-running outdoor festival will serve up “tastes” of foods from around the city at the Crossroads of the World next month. “Taste of Times Square” will return for the 24th year in a row on Monday, June 5 from 5 to 9 p.m., the Times Square Alliance said in a press release. More than 50 vendors including Barbetta Restaurant, Frankie and Johnnie’s Steakhouse, Carmine’s, John’s of Times Square and B.B. King Blues Club and Grill will offer dishes ranging in price from $1 to $6 along West 46th Street between Broadway and 10th Avenue, the release said. Burger & Lobster, Brooklyn Ball Factory and Wafels & Dinges are among the eateries participating in the festival for the first time this year. In addition to food, the festival will offer drinks from the Heartland Brewery at a beer garden set up on West 46th Street, between Eighth and Ninth avenues, the release said. Attendees will also be able to take swing dancing lessons at an “Entertainment Tent” and hear musical performances along the stretch.